Aiea resident and football fan Gervin Miyamoto has a flat-screen TV, refrigerator, microwave oven and NFL memorabilia in his man cave. IT'S PROBABLY just a coincidence that with the real possibility of a woman becoming president, men are wistfully thinking of those warm, fuzzy good old days when they lived in caves. And embracing the underutilized process of devolution, some men actually are racing into the past, building their own "man caves," compact little comfort zones within their homes where they can be alone with their friends and their manly pursuits: watching football, drinking beer, playing poker and, if the chicks really aren't around, checking out the Oxygen channel. Man caves are better known on the mainland, where space isn't a problem. But some island dudes are setting off a small part of their homes or grounds for their own caves. Andy Campbell, who runs a popular Internet site called To the Man Cave, told me, "Even the smallest of Man Caves is still better than no Man Cave at all." 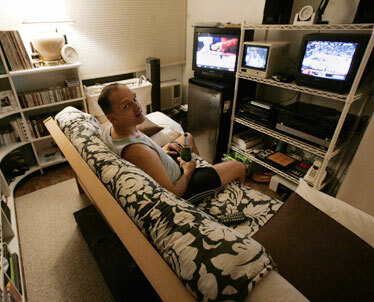 Bret Iseke's Hawaii Kai man cave has three TVs so he can watch three games at once. Gervin Miyamoto, a retired Honolulu police officer who now works with the U.S. Attorney's office, has what's likely the most spacious and elaborate man cave in Hawaii. A sweeping spiral staircase leads to Gervin's space, which features a 46-inch Bravia LCD high-definition television, wine chiller, wet bar and private bath. On the other end of the amenities scale, Jay Yano, owner of a Honolulu custom screen-printing company, converted his garage into a man cave, a sort of homage to the days when the man of the house might have to hide out in his woodworking shop to find a few moments of solitude. "My wife controls the kitchen and living room. Where am I to go?" 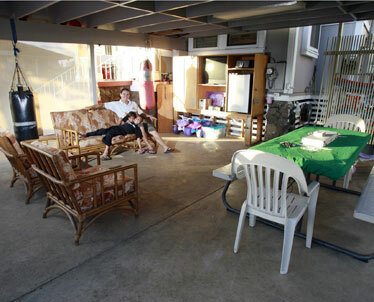 Jay Yano converted his McCully home carport into a lounge. His outdoor area includes a television, PS3 and X-Box game consoles, stereo, fully stocked refrigerator, card table, punching bags and a pit bull named Tatsu. Pictured with Yano are his children Jonah, 7, and Brooklyn, 5. WOMEN ARE GREAT. Up to a point. Seriously. It's not a gay thing. It's a guy thing. Sometimes guys just want to sit around in their underwear, watch football on TV and drink a beer in peace. Hey, it's not their fault that in Hawaii the game's on at 8:30 a.m.
» No input from your significant other. Otherwise, you'll have to say, "Yup, this is my man cave. But my wife picked out the couch." Don't be that guy. » Spend as much time in your cave as possible. No one ever died from spending too much time in his man cave. Divorced, maybe, but you won't die. » Do whatever it takes. If you have to build your wife a crafts room first, fine. Necessary evils in favor of the greater good are part of life. » Go for regional flair. For Hawaii, mount a UH quarterback Colt Brennan jersey on the wall. If money is no object, a surfboard owned by Duke Kahanamoku. » Take into account the friends you will have over. Make them help with construction. Source: Andy Campbell of tothemancave.com, special to "Honolulu Lite"
Men have come a long way, baby. We've gone along with the women voting thing. The women wearing pants thing. The women getting paid more than we do thing. (Well, we're not completely cool with that last thing.) Come on, men have hardly whined at all about all the great strides women have made in society. But men still need their own private space, where they can revert to some of the less attractive behavior men are known for (see above, re: underwear). They need to act like cavemen every now and then. Or at least men WITH caves. Which is why the curious social devolutionary craze of man caves has swept the country. Man caves are private hideyholes men build in their houses (or sheds, garages or carports) where they can hang with their male friends and do those manly things women hate about men, like putting their beers on tables without coasters, watch three televisions at once and eat pork rinds that have sat out so long they show signs of respiration. 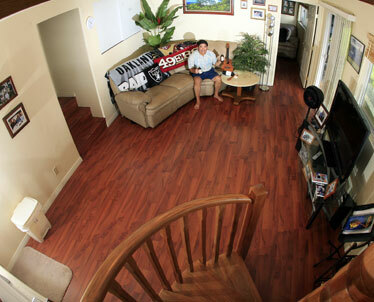 When interisland airline pilot Bret Iseke moved in with his fiancee, he knew that even though the Hawaii Kai house was big, he still needed a private space. So, with the support (i.e., permission) of his fiancee, he commandeered a small room in the house and converted it to "Bretavia," a man cave where he says he enjoys "diplomatic immunity." "It's my little city of refuge," he says. "She understood that in order for me not to feel too emasculated, I had to have a little place where I could anchor my manhood." That place is a bookshelf-lined room with three TVs, two VHS player-recorders, three DVD players, a refrigerator full of beer and poke, and a couch placed so that all of the above are just within arm's reach. "I stay right in there so I don't bother anybody," he says, "listening to the UH game on the radio while watching three different football games." That's a kind of advanced entertainment technique only practiced by the male of the species and generally referred to by the female of the species as "stupid." 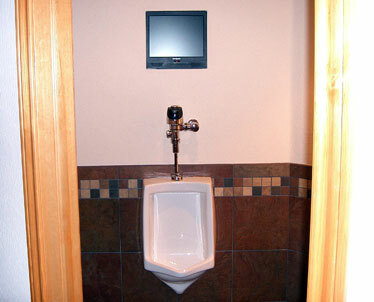 One man cave owner made sure that even while using the restroom, visitors won't miss the game. Gervin Miyamoto is a former Honolulu police officer who now works in the U.S. Attorney's office. He's converted a downstairs portion of his Aiea home to a deluxe man cave with a huge flat-panel TV, wine chiller, wet bar, microwave and full bath. I asked him if his wife was allowed inside. "Heck no," he said, "It's a reserve. When I get yelled at, I go downstairs. If I need to do yardwork, I can say I'm doing the yard but I'm still downstairs." He realizes that most guys don't have the space (or wives) that would allow for such a large man cave. "Then find a corner in your home that is away from everybody and make it your man cave," he says. "You need your own space where you and guys can just hang out, let out the anxieties of the world, have a grand time and make all the noise you want." Faced with such space limitation, Jay Yano, owner of BadBoy Hawaii, a custom screen-printing company, set up his man cave in his garage. It's basically some chairs and a TV. "The wives are inside, we're outside with the kids," he says. "While the kids are playing we aren't just sitting, watching football and drinking beer; we're watching the kids." Alan Campbell, who runs the Internet site To the Man Cave, stresses that even in Hawaii, space should not keep you from having a man cave. "Owning a man cave is a huge step in your evolution as a male member of society," he says. "The novelty of all the other stages of life will wear off. But you and your man cave will grow old together."